A luxury superyacht is possibly one of the most desirable trappings of the super-rich lifestyle. As well as making for a highly visible status symbol, it offers unbeatable privacy and comfort along with the freedom to travel the world. But what if you could go one step further, and explore the seas under the surface as well as above? A unlikely sounding type of vehicle is fast gaining popularity among the world’s richest travel lovers, and that’s the personal luxury submarine. It’s thought that there are currently around 100 luxury private submersibles of various kinds exploring the planet’s deeper waters, but details are sketchy. For security and privacy reasons, most owners ask for secrecy clauses when purchasing them from the few manufacturers operating in this field. However, the market seems to be split into two basic types of underwater vehicle. There are miniature subs seating one or two people, resembling nothing so much as a large bubble with flotation tanks. Moving to the other end of the scale, there are hyper-expensive full submersibles which blur the line between superyacht and submarine, providing enough space to host exclusive parties down in the depths, and able to navigate underwater for extended periods. The new Aurora-6 personal luxury submarine from the SEAmagine Hydrospace Corporation neatly bridges the gap between the two styles. 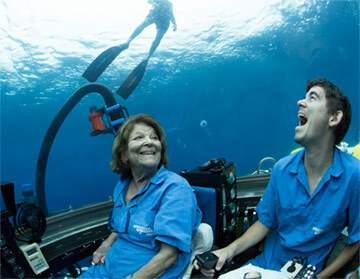 Seating a total of six people, including pilot, this submersible provides a luxury underwater experience lasting up to eight hours, in total comfort, and with unbeatable facilities for viewing the undersea environment. SEAmagine have around twenty years of experience building small submarine vehicles for both private and scientific clients, and have poured all the knowledge gained over more than 12,000 dives into this new model, their largest and most well appointed yet. The Aurora-6 will be officially unveiled at the Monaco Yacht Show 2016, taking place from 28th September, but here are a few of the most striking features that have been detailed in advance. The passenger area includes a pilot’s seat, an owner’s lounge seating two, and a guest lounge seating three on swivel chairs for unbeatable viewing in every direction. The specifications indicate a depth rating of up to 1000m. The large acrylic hyper-hemispheres offer virtually unobstructed views of the underwater world, to the sides and above. For comfort, an emergency restroom facility is located at the rear, able to be sealed off for privacy. The craft boasts a dive time of around eight hours, and a life support reserve capacity of 96 hours. The Propulsion speed is three knots, provided by four horizontal and two vertical 10hp thrusters. Navigation is provided by GPS, as well as a dual-frequency sonar system. Five individual LED floodlights provide high visibility, even at depth and in less than perfect sea conditions. Optional extras include external robotic arms and HD video equipment. And the cost of all this opulence and technological prowess? At around $5m this is certainly a rather expensive toy, but when set in the world of superyachts costing ten or more times that figure, it offers a unique experience for a realistic price, ideal for superyacht owners who wish to enjoy luxurious freedom of the seas below the surface as well as topside.